"On most assignments, I tend to travel with a full range of Nikon prime lenses - albeit tilted to their wide angles. But this last week, when I travelled to the spectacular Simien Mountain range in Northern Ethiopia, I travelled light as I intuitively knew that I only needed to take my “go to” 28mm wide angle lens". The reason for this was twofold. Firstly, I knew the views would be majestic and biblical from the 12,000 feet peak of the escarpments that any image that didn’t convey this narrative would fail. Secondly, my research repeatedly told me that with the right local guide, the gelada baboon would not only be found with ease, two hours after dawn and 2 hours before dusk around the escarpment edge, but also that proximity would not be an issue. This made the 28mm lens an easy choice. The air is thin at 12,000 feet and I was glad of a light camera bag. But I still found myself easily out of breath and grumpy because the mornings were simply not working. The view down from the escarpment takes the full brunt of the morning sun and the gelada’s eyes narrow and squint when facing the sun. I never like working “with the light” anyway but it was clear that the big opportunity for my preconceived shot would be from 5 pm onwards. 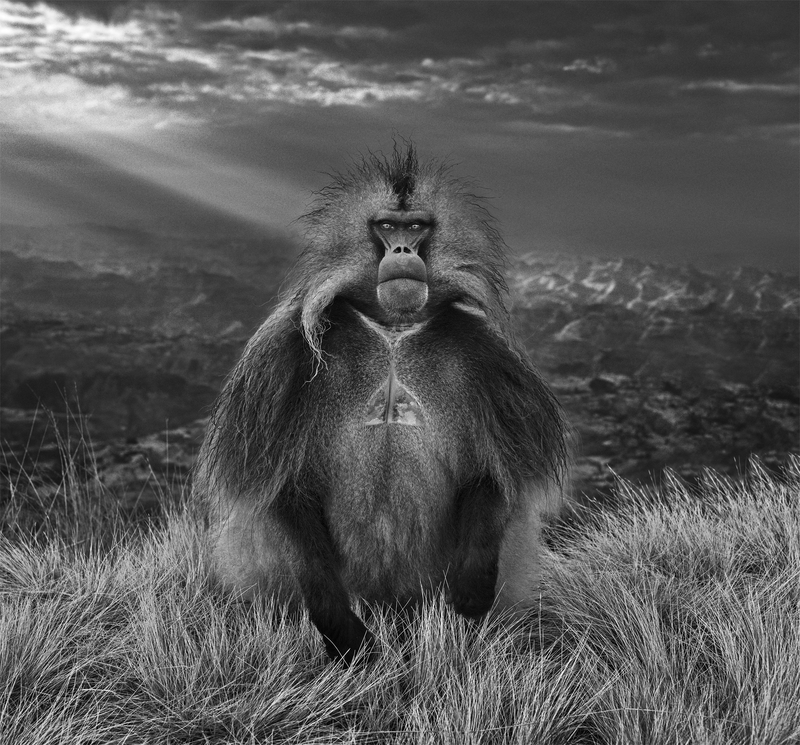 The gelada is the most decorative ape in the world - its beauty simply can’t be compromised by harsh light. On Sunday afternoon, there was a torrential rain storm and I had all but given up for the day but around 4 pm, the rain and thunder stopped and the escarpments were slowly brought to life with shafts of low late light. And so it was that we left the comfort of our dry camp and in one precious moment, I had the perfect encounter with a male gelada in an ideal spot. Better still, the rain had transformed his hair from its traditional style into an electrified one. A bit like the Grumpy Monkey from a few years back, freak weather has given the image the edge. I do my job for moments like this. This photograph - as well as any I have taken in the last few years - hammers home the diversity of our planet. The human was trespassing in the ape’s mountain kingdom. His eyes say everything - the conviction of proprietorial residence for sure but also dignity and resolve. Meanwhile to me, he will always remind me never to go anywhere without a 28mm wide angle lens.